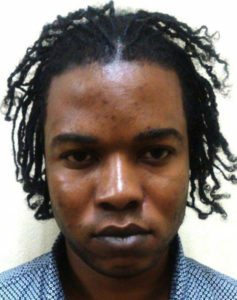 Fitzroy Andre Coore photo in the Antigua newsroom story announcing his arrest in Antigua. Basseterre, St. Kitts, May 12, 2018 – Fitzroy Andre Coore, a Jamaican fugitive, who was hiding out in St. Kitts, was wanted in Jamaica for a case of shooting with intent committed in December 2017. That’s according to the Jamaica Observer newspaper of January 19, 2018, which names Coore among a Police list of Jamaica’s 30 most wanted. “Fitzroy Andre Coore otherwise called ‘Bees’, whose last known address is Alexander Drive, Farm district, Clarendon. Coore is 23-year-old, dark complexion, medium build and is about 170 centimetres (5 feet 7 inches) tall. He is wanted for a case of shooting with intent committed in December 2017,” the Jamaica Observer posted. Antigua newsroom reported that Coore was apprehended and taken into custody during a joint operation between Antigua Police and Immigration officials at the airport on Friday. “He had just disembarked LIAT flight #317 from St. Kitts, where he was hiding out over a period of time,” said Antiguanewsroom. A Grays Farm woman was also taken into custody by police and is assisting them with their investigations into the matter. Both Antigua and Barbuda Police and Immigration officials are currently making arrangements to have the wanted fugitive escorted out of the country and handed over to Jamaican authorities sometime next week. How and when did Coore arrive in St. Kitts and Nevis? Why was Coore not flagged by local emigration authorities when he presented his travelling documents to board LIAT Flight 317 at St. Kitts’ Robert L. Bradshaw International Airport on Friday afternoon.